Aston Martin has confirmed production of its first all-electric model, due to hit the roads in 2019 in a limited build run of 155 cars. 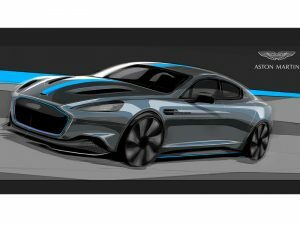 Design sketch of forthcoming Aston Martin RapidE electric vehicle. Based on the forthcoming Rapide AMR concept, the RapidE follows on from the original RapidE Concept unveiled some two years ago and, as with the concept, is part of a collaboration with Williams Advanced Engineering. Aston Martin has not revealed details of the powertrain but CEO Andy Palmer emphasised that conventional engines will remain a part of the carmaker’s plans.